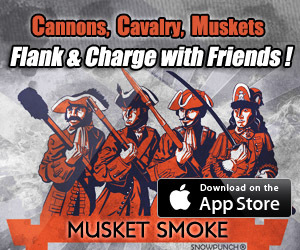 As I enjoy Apple’s new Swift programming language I have been taking breaks playing Musket Smoke when I can. I’m seeing some really great new talent out there. Likewise it’s comforting to see several ‘Grand Duke’ ranking players still guarding their hard earned reputations with a regular staple of seasoned destruction. These battle hardened Commanders are the ultimate goal for all of us. Every Duke loves an tense Duke vs Duke battle. It’s the opportunity to really test yourself. Likewise, newcomers enjoy the swath of potential tactical knowledge gained. Plus most Dukes enjoy teaching in some form or another. Usually by simply making good moves. Grand Dukes are also the ultimate source of challenge, study and learning. We all feel lucky when we get the chance to cross swords with one of the Grand Dukes. Here are a few basic tips for the newcomers. Don’t worry if you see no action when you start an online match. For the last year there has been a consistent average between 400 to 600 sessions daily. Most of these are matches already in play. Some of us play just 1-3 matches making one move in each battle a day. Others play a few rounds a day. There are also a few enthusiasts that play more than a dozen matches at once and play as often as they can. There are also a few people testing the app for the first time and deciding to not play anymore after starting a match. If your opponent hasn’t played for 4 days you can delete the match and still gain a point. Start a few matches until you get the amount of daily activity that you desire. Keep in mind that people are playing from all over the globe. If you start a match with someone and they don’t move for a while it’s probably because it’s 2am and they are sleeping, they have to get up and then probably goto work. They might like to make their daily moves after dinner. Have patience. You probably won’t know if you have the right amount of activity that you desire for a few days. Make Friends. If you find someone you really enjoy playing and want to play them more frequently you can try to become their Game Center friend. You can do this by tapping the trophy on the main screen and select Top Mini (if it was a mini match) or Top Commanders (for campaign matches). You then tap ‘all time’ in the top right corner. This then displays 3 options (Today, This Week, and All Time). Select This week. Then scroll down until you see that person you like. If you tap their name you will see a giant green bubble that says “Send Friend Request”. Just remember friend matches are not ranked and so while you will still collect pie points and your named ranking will improve, your position in the leaderboards will not. If you want a better rank position when you become a Grand Duke then don’t play too many friend matches. That said, nothing beats a great Musket Smoke friend to help you get your battle legs. Plus you can always progress your ranking by simply playing random matches. Like Chess: Musket Smoke was designed to be richly tactical much like chess only in a more flashy and rewarding manner. It’s one of those games that you could play for the rest of your life. The reason I will enjoy my eventual retirement is because this game exists. I wanted (needed) a creative fun tactical game like this and so now it exists. Position is everything. Everything starts and ends with positioning. Cavalry can move 5, Pikemen 3 and everything else 2. That’s only 3 things to remember. Understand Zone of Control. You want to inflict the most damage right? The most damage is who ever does the most damage after both sides have moved. Knowing ZOC well lets you clearly decide how far forward you can go without getting trapped and killed by the enemy. The closer to that line you play the more you are like a Grand Duke, maximizing your attack opportunities while also minimizing damage to your troops. Knowing ZOC and staying 1 hex out of the kill zone is the key to always being on that razor edge of battle. Always have one unit more in any fight. If 3 units appoach your 2 units, back off. Lead them towards your other 1 or 2 units where you can match or outnumber. The greatest battles always start with a dance where units vie for position on the razors edge of battle, looking for that one unit advantage. Know when to ‘break away’. Your unit is locked in battle. Did a cannon move into flanking range? Are a couple units going to hit your rear next round? If so break away. If not you still might want to break away if you can replace the space with a stronger unit like a fresh Musket Unit or open a path for a charge. Also sometimes the right breakaway can re-order your line of units and make a nice defensive line. Use Cavalry ‘break aways’ frequently. Note that there is no penalty for cavalry breaking away from foot units. You should be breaking away from these no-penalty situations as often as it helps you. It’s part of how cavalry can harass and lure units into better places for attacking them. Is one foot unit blocking your path? A charge isn’t always the answer. Especially if it leaves you were you can be swarmed and killed. Often the better choice is to move next to the unit and do nothing. The foot unit will not damage you upon first melee lock as vs cavalry this is an ‘attempted lock’. You can simply move away from it with no damage and move around the blocking unit and be on your way to hunting artillery units. Watch your morale. Technically speaking, standard units can take 3 morale hits and then they are routed. This destroys the unit just as well as killing every single man. If a unit’s morale is low then really think about pulling it back and keeping it as a reserve unit or a rear defender. That’s it for now. Later I’ll probably do another article. Secrets of the Grand Dukes and after that maybe an advanced video tutorial. Right now though I’m swamped for time.